How much are scrap computer boards worth? 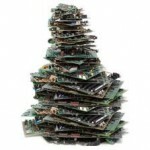 Scrap computer boards contain an array of precious and high value metals; Gold, Silver, Palladium and Copper. 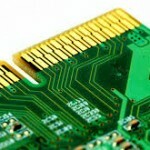 The precious metal content makes computer boards a worthwhile commodity and in large quantities can become quite valuable. Many different computers have existed over the last number of years and technology changes very rapidly, therefore the precious metal content of a circuit board today is not the same as 20 years ago. Computer boards from the 20th Century are of much higher precious metal content than the more modern style boards. On a daily basis the precious metal markets are changing. This change in markets means that the price of computer boards also changes daily. If the gold market goes up, then the circuit board price will go up, and vice versa. The weight of computer boards supplied by the client also effects the price paid for them. Small quantities of a few kilos will fetch a much lower price than large batches of over 1 ton. We recommend building up your load to get the maximum return. With so many different factors effecting the price (markets, weight, age of the boards etc), we have to price each load on an individual basis. Therefore we do not list prices on our website.